St. Mary's Orthodox Church on Sunset Drive in Corning will observe its 100th anniversary with a public celebration Oct. 12. CORNING –A small church that has served Eastern European immigrants and their descendants in the Corning area since the early 1900s is celebrating its 100th birthday soon, and the public is invited. St. Mary’s Orthodox Church on Sunset Drive in Corning was founded in 1914 by immigrants from the Carpatho-Russian Mountain region, in what is now Slovakia and the Czech Republic. Today, about 50 or so regular church-goers climb the steep stairs to attend services in the church building that was erected in 1917. St. Mary’s Orthodox Church is only a few blocks from the much larger St. Mary’s Catholic Parish on State Street, and people sometimes confuse the two, said Father Daniel Mahler, pastor of St. Mary’s Orthodox Church. 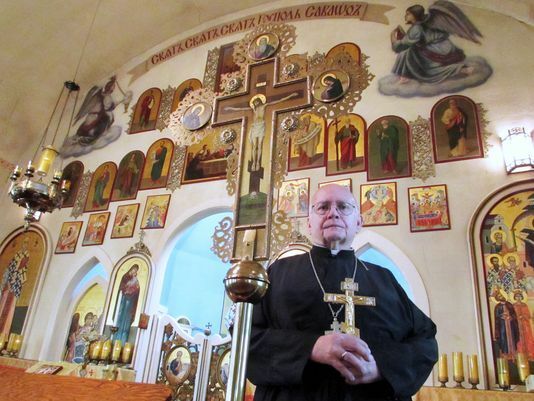 St. Mary’s Orthodox Church is aligned with the American Carpatho-Russian Orthodox Diocese of the U.S.A., based in Johnstown, Pa.
Bishop Gregory of Nyssa, primate of the American Carpatho-Russian Orthodox Diocese, will be a special guest at a 100th anniversary celebration Oct. 12. Former pastors of the parish will also take part in the observance, which is open to the public. In addition to celebrating its centennial, St. Mary’s Orthodox Church is also looking for a new home. The current church on Sunset Drive sits on a steep hill, requiring worshipers, many of them elderly, to ascend a difficult stairway. The church has been saving money for a move and is now looking for a suitable new home, Mahler said. There is a lot of history and nostalgia in the existing building, and the congregation doesn’t plan on leaving it all behind.